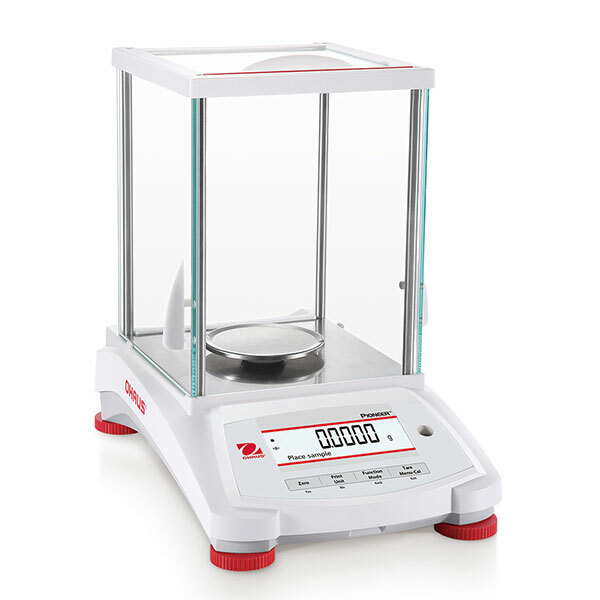 The Ohaus PX224/E analytical balance has a capacity of 220 grams with a readability of 0.1 milligram and comes with a 3.54" (90mm) diameter weighing pan. The Ohaus Pioneer PX combines essential weighing functionality with competitive performance, offering high accuracy and repeatability for applications in laboratory, industrial and education settings. The Pioneer PX is affordably priced, and intuitively designed for intelligent operation with a second line display for additional information, and USB and RS-232 connectivity for easy communication. 2 Line Display A brightly lit dual line display shows the weight in an easy-to-read manner, while a dot-matrix second line provides additional information or guidance prompts to the user. Durable Construction Featuring a cast metal lower housing, metal sub-pan, stainless steel weighing pan and removable draftshield or side doors, the Pioneer is durably constructed for long-term use, and suitable for a variety of applications. Communication Ports Standard RS-232 and USB device ports allow for easy connectivity to printers and other peripherals, allowing convenient capture of results. OHAUS' free data collection tool (SPDC) provides a simple solution to import this data directly in formats such as Excel, Access, .txt, .csv etc..